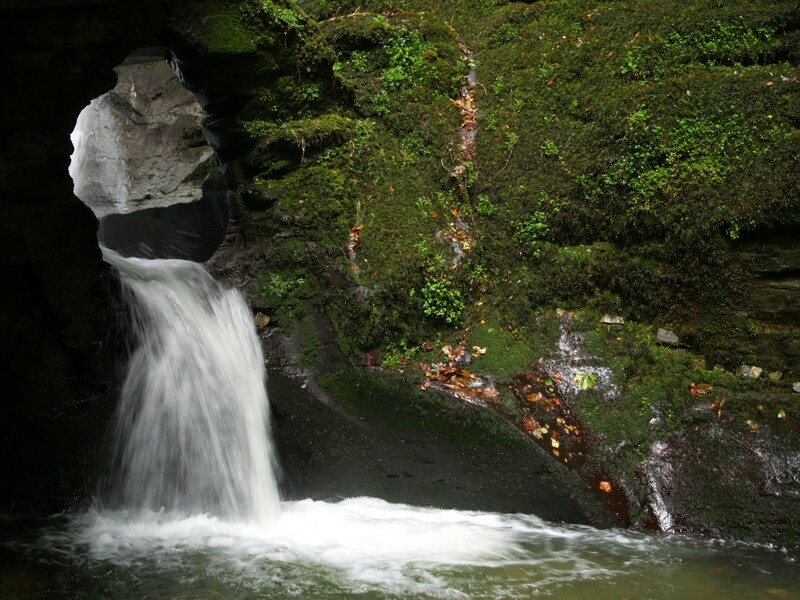 St Nectan’s Waterfall is in St Nectan’s Glen, an area of woodland in Trethevy near Tintagel, north Cornwall, stretching for around one mile along both banks of the Trevillet River. A link to the history of the site is here. 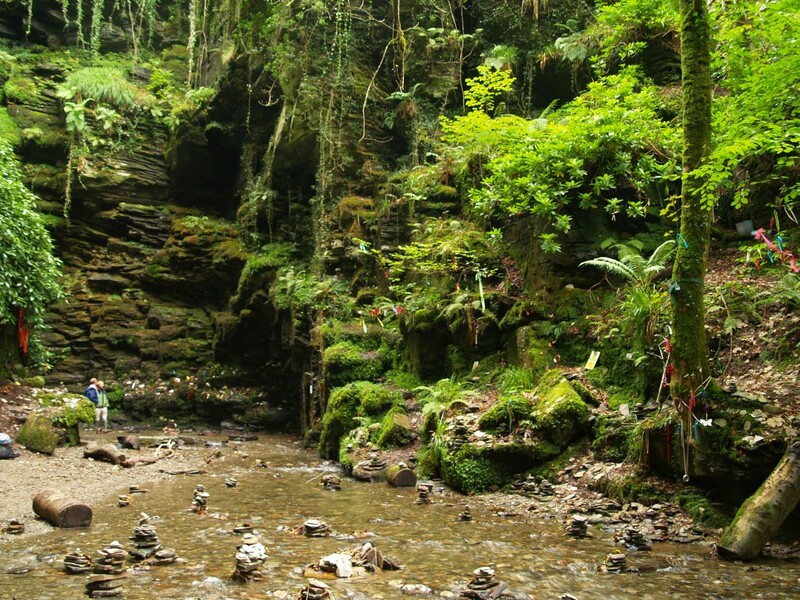 In the Cornish language St Nectan’s Glen is Glynn Nathan, meaning deep wooded valley of Nathan. 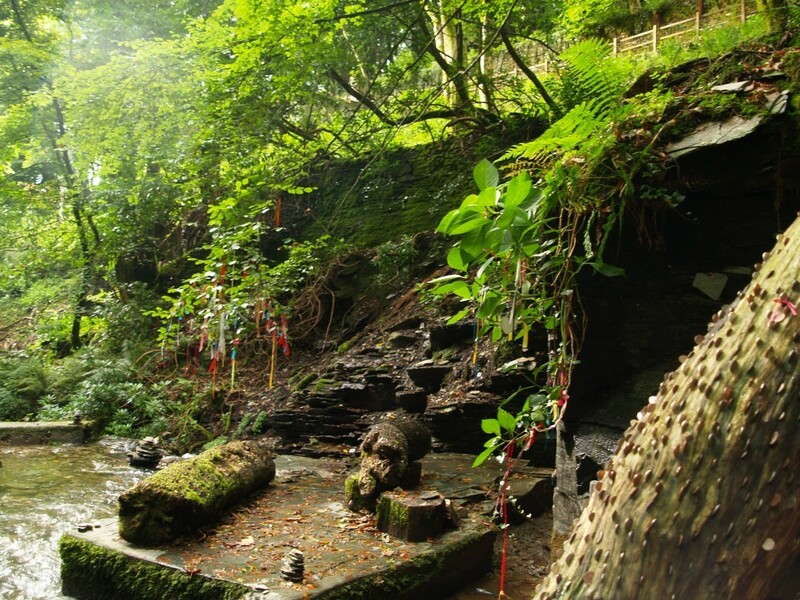 The sixth-century Saint Nectan is believed to have sited his hermitage above the waterfall. According to legend, Saint Nectan rang a silver bell in times of stormy weather to warn shipping of the perils of the rocks at the mouth of the Rocky Valley. ‘The sunset of life gave to the saint the spirit of prophecy, and he told his weeping followers that the light of their religion would grow dim in the land; but that a spark would for ever live amidst the ashes, and that in due time it would kindle into a flame, and burn more brightly than ever. His silver bell, he said, should never ring for others than the true believer. He would enclose it in the rock of the Kieve; but when again the true faith revived, it should be recovered, and rung, to cheer once more the land. Full story on sacred texts here. 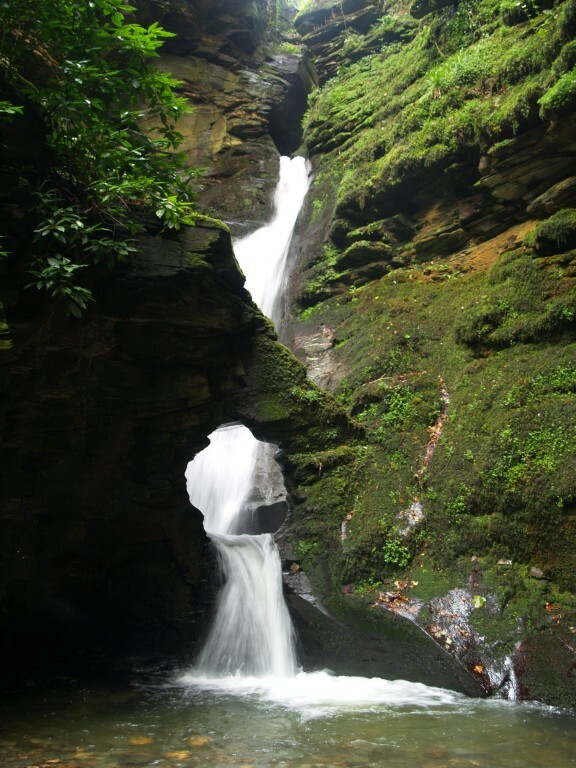 During a short break in north Cornwall and returning from a visit to nearby Boscastle, I visited St Nectan’s waterfall by chance on Wednesday, 16 September 2015. 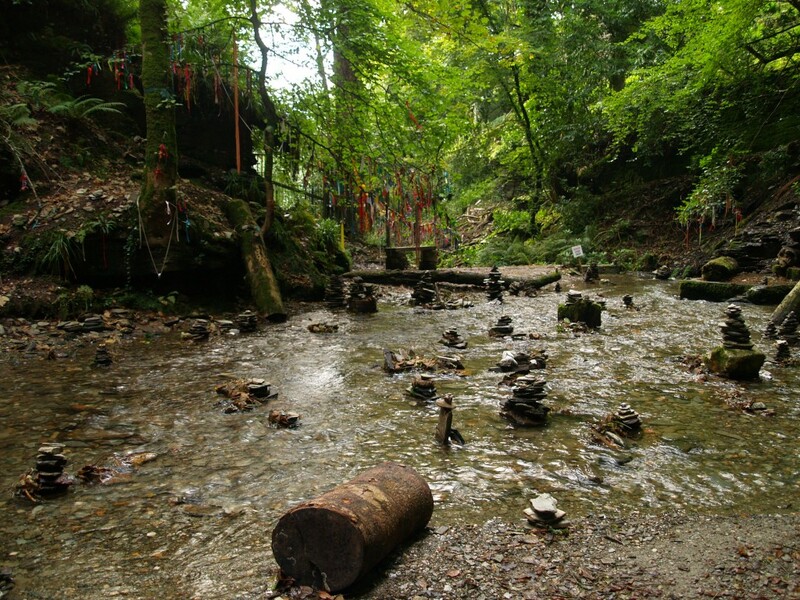 Before arriving at the waterfall, on the pathway besides the river, is a signpost with the word ‘Halgabron. The sign points across a wooden bridge to a path on the far side of the river. I crossed the bridge and followed the path, which eventually came out into a meadow. I subsequently established that Halgabron, the name of a nearby hamlet, is a Cornish word meaning ‘Marsh of the carrion crow’. 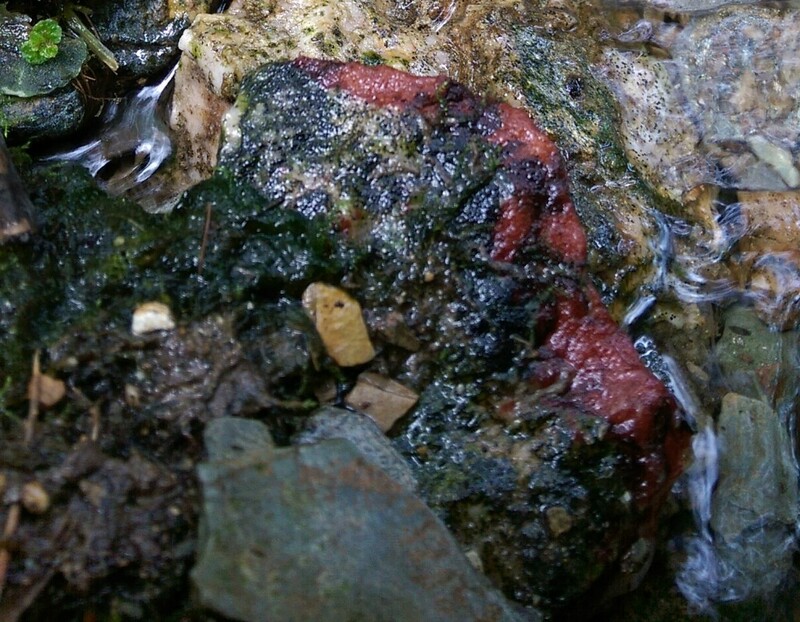 Many of the rocks in the river are coated in a vivid red colouring, which, if also present during prehistoric times, must have represented as striking a sight to our ancestors as it posed to my eyes. The origin of the name of the Trevillet river is a Cornish word meaning ‘Dark river’. At their highest point, the slate canyon walls tower over seventy feet above the river below. The legend of St Nectan is outlined here and here. 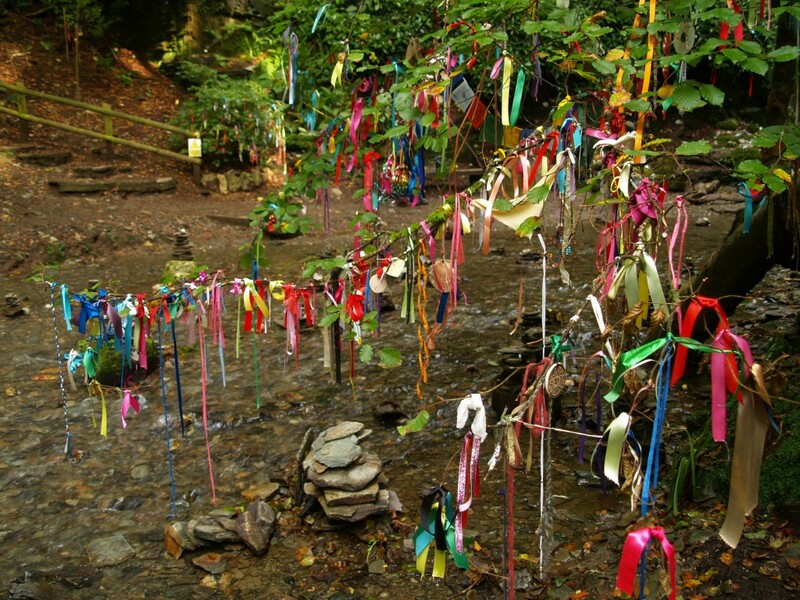 Ghostly monks have been witnessed chanting along the pilgrim path, as well as two spectral grey women, said to be St Nectan’s sisters who are buried beneath a large flat slab in the river, near the bottom of the waterfall. St Nectan himself is said to be buried in an oak chest somewhere below the river. Thank you to Sophie Kinsley for use of the photographs.